Last year, the administration announced it was preparing a series of “reforms” after it was caught wiretapping the phone lines of journalists with the Associated Press. In what has become the standard practice of the administration, however, the banner of “reform” has been used to obscure the establishment of the legal foundations for a police state. Although the administration presents the new protocols as protective of democratic rights, the content of the order represents a significant escalation in the attack on freedom of speech and freedom of the press. As an initial matter, the order is an assertion by the executive branch that it has the power to regulate itself on pressing constitutional matters. Under the separation of powers doctrine, however, the U.S. Constitution proscribes precisely such conduct. If the executive branch has the right to determine for itself the constitutionality of its own actions, then presumably the judicial branch exists simply to rubber stamp the executive’s decisions. This implies that there are no limits to efforts by the executive to expand its powers. The regulations announced by the administration in themselves amount to an assertion of massive repressive powers. Under the new rules, the power of the attorney general to use “certain law enforcement tools, including subpoenas, court orders…and search warrants to seek information from, or records of, non-consenting members of the news media” is greatly expanded. Among the protocols that ostensibly limit the power of the executive branch to rummage through journalists’ papers and documents, one regulation stands out. The Department of Justice order standardizes a process of government intimidation through which journalists will be given the opportunity to “voluntarily” hand over their communications and notes through what the Department of Justice calls “negotiations.” The order sets forth that the government will be allowed to exercise a subpoena or search warrant only after negotiations have taken place. The imposition of such a “negotiation” requirement has chilling implications for freedom of the press. Under this requirement, officials from the executive branch will visit journalists in their homes and workplaces and bully them into handing over communications and work product under threat of prosecution and subpoena. 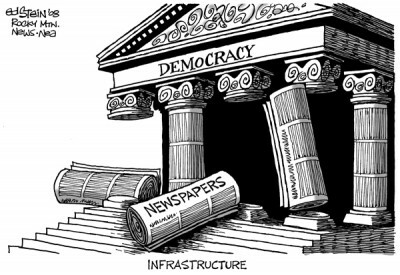 Aside from being forced to break source confidentiality, members of the “fourth estate” will now be obliged to carry out their investigations under the constant threat of a phone call or visit from government “negotiators.” Journalists will operate under a climate of fear in which only the most courageous will consider making connections with whistleblowers, and only the boldest will work to expose government lies and crimes. For the Obama administration, these are not unintended consequences. To the contrary, the administration sees quashing all exposures of government illegality—such as the revelations of massive government spying by NSA whistleblower Edward Snowden—as a central goal. Fearful of the impact the leaks by Julian Assange, Bradley Manning and Edward Snowden have had on the political consciousness of the population, the administration hopes that the imposition of a “negotiation” requirement will force journalists to think twice about publishing information that runs counter to the interests of the state. Even the supposed restriction on government surveillance and persecution of reporters in the form of the negotiation requirement can be easily evaded. The rule that a negotiation must occur between the government and a journalist before a subpoena or warrant is issued can be overridden if “the Attorney General determines that, for compelling reasons, such negotiations would pose a clear and substantial threat to the integrity of the investigation, risk grave harm to national security, or present an imminent risk of death or serious bodily harm.” This is a loophole wide enough to drive the proverbial truck through. It should be noted that the criterion defined by the phrase “reasonably likely” is extremely loose, giving the government license to spy far beyond the scope of the “probable cause” standard spelled out in the Fourth Amendment. The decision to apply this exception, moreover, will be made unilaterally by the executive branch, without any review or sanction from a court of law. This exception is clearly intended to apply to journalists such as Assange and Glenn Greenwald, who work with (“aid and abet”) whistleblowers like Bradley Manning and Edward Snowden (“criminals” under the Espionage Act of 1917). In effect, this means that any journalist who helps publish leaked material is engaging in activity that is related to a criminal investigation and therefore forfeits both his or her First Amendment and Fourth Amendment rights. The order also includes the “restriction” that the attorney general himself expressly authorize subpoenas, warrant applications and court-ordered seizures. But this is not a genuine limitation. To the contrary, it is an expansion of the powers of the chief federal law enforcement official. In other words, journalists can be brought before a court under oath to testify on the content of forum posts made by readers. These unprecedented attacks on press freedom are being carried out by the Obama administration on the basis of the pseudo-legal argument that democratic rights must be “balanced” against national security needs. Such a balancing test is unconstitutional on its face. There is no asterisk at the conclusion of the Bill of Rights—no caveat that “some restrictions may apply.” To the contrary, the basic democratic rights of the population were declared “inalienable” by the signers of the Declaration of Independence. But these rights find no defenders within the contemporary political and media establishment.